A few spaces are left for artist Lyn Slade's Trunk Show and Needle Felted Art Workshop. Please reserve your space by this Saturday, July 11th, so that Lyn can create a packet of materials just for you. Materials costs are $12 per person, which you can bring on the day of the event, (Thursday, July 16th at 6:00 p.m.) Call the library at: 508-760-6219. Lyn will present her needle felted artwork and explain how she got started with this medium and the journey she has taken, from pattern designer to author to using her art in a healing journey. During the workshop, the participants will have a chance to create needle felted artwork. Needle felting requires the use of a very sharp barbed needle, therefore it is designed for teens and adults. 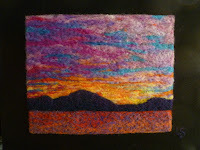 Everyone will learn the basics of needle felting while creating a 5” x 7” landscape. Each person should have the piece completed by the end of the workshop, and it will be suitable for framing or gifting. The $12 materials fee will cover everything needed for the workshop and everyone will go home with the foam work surface and the specialized needle to continue on an individual journey into needle felting.